In botany, the petiole (/ˈpiːtioʊl/) is the stalk that attaches the leaf blade to the stem. :87:171 Outgrowths appearing on each side of the petiole in some species are called stipules. 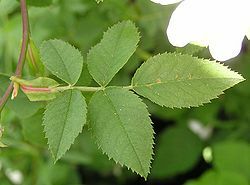 Leaves lacking a petiole are called sessile or epetiolate. In plants with compound leaves, the leaflets are attached to a continuation of the petiole called the rachis. :98 Each leaflet may be attached to the rachis by a short stalk called the petiolule. :87 There may be swollen regions at either end of the petiole known as pulvina (singular=pulvinus):97 that are composed of a flexible tissue that allows leaf movement. Pulvina are common in the bean family Fabaceae and the prayer plant family Marantaceae. A pulvinus on a petiolule is called a pulvinulus. In some plants, the petioles are flattened and widened, to become phyllodes or phyllodia, or cladophylls and the true leaves may be reduced or absent. Thus, the phyllode comes to serve the functions of the leaf. Phyllodes are common in the genus Acacia, especially the Australian species, at one time put in Acacia subgenus Phyllodineae. In Acacia koa, the phyllodes are leathery and thick, allowing the tree to survive stressful environments. The petiole allows partially submerged hydrophytes to have leaves floating at different depths, the petiole being between the node and the stem. In plants such as rhubarb (Rheum rhabarbarum), celery (Apium graveolens), artichokes and cardoons (Cynara cardunculus) the petioles ("stalks" or "ribs") are cultivated as edible crops. The petiole of rhubarb grows directly from the rhizome and produces the leaf at its end. Botanically it is categorized as a vegetable and culinarily used as a fruit. Petiole comes from Latin petiolus, or peciolus "little foot", "stem", an alternative diminutive of pes "foot". The regular diminutive pediculus is also used for "foot stalk". ^ a b c d Beentje, H. The Kew plant glossary. London: Kew Publishing. ISBN 9781842464229. ^ a b Mauseth, James D (2003). Botany: An Introduction to Plant Biology. Jones & Bartlett Learning. ISBN 0-7637-2134-4. ^ Heywood, V.H. ; Brummitt, R.K.; Culham, A.; Seberg, O. (2007). Flowering plant families of the world. New York: Firefly Books. ISBN 9781554072064. ^ Foust, Clifford M. (1992). Rhubarb: The Wondrous Drug. Princeton: Princeton University Press. ISBN 0-691-08747-4. "Petiole" . Collier's New Encyclopedia. 1921. Wikimedia Commons has media related to petioles.